Deciduous, erect, much-branched shrub, often densely colonial from rhizomes, 0.5-3 m tall; older stems dark greyish-brown with shredding bark; branchlets glabrous; twigs thin, wiry. Opposite, on stalks 2-4 mm long, elliptic to oval, 1.5-5 cm long and 1-3.5 cm wide, obtuse at base and tip, margins entire or occasionally with a few wavy teeth; leaves often larger and irregularly lobed on sterile shoots; glabrous above, glabrous or spreading-hairy beneath. Inflorescence of short, dense clusters (racemes) of few, short-stalked to nearly stalked flowers, at ends of twigs and often also in upper leaf axils; corollas widely bell-shaped, 5-7 mm long, hairy within; petals pink to whitish, fused at bases into tubes that flare at top to 5 lobes, which are as long to half as long as the tubes; styles 2-3 mm long, glabrous; stamens shorter than corolla lobes, the anthers 1-1.5 mm long, about as long as the filaments. Berrylike drupes, densely clustered, waxy white, ellipsoid or nearly globose, 5-15 mm long; nutlets 2, each enclosing a seed; some fruits persist through the winter. 1. Stems erect, more or less branching, 0.3-3 m tall. 2. Corollas relatively short and wide, the lobes nearly equalling the tubes. 3. Styles short, not exserted from the corolla tube, glabrous. Mesic to dry meadows, disturbed areas, grasslands, shrublands, and forests in the lowland, steppe and montane zones; extremely common in S BC, common in C BC, infrequent northward; N to NT, E to PQ, and S to NE, VA, CO and CA. 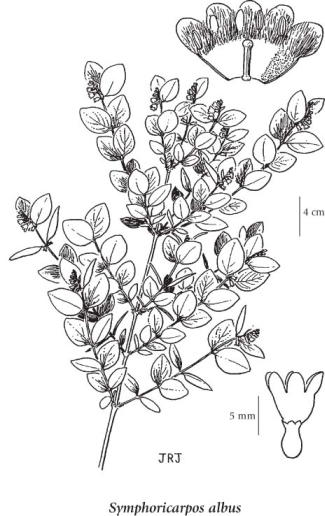 A shade-tolerant/intolerant, submontane to montane, transcontinental North American deciduous shrub. Occurs on nitrogen-rich soils within boreal, temperate,. cool semiarid, and mesothermal climates; its occurrence decreases with increasing elevation and precipitation. Tolerates fluctuating ground-water tables. Scattered in coniferous forests, plentiful in broad­leaved forests on water-shedding and water-receiving (floodplain) sites; persists on cutover areas. Commonly associated with Aster conspicuus, Calamagrostis rubescens, Mahonia aquifolium, M. nervosa, Spiraea betulifolia, and Rhytidiadelphus triquetrus. Characteristic of Moder and Mull humus forms.